ARCHIVE NOTATION: This is the first book to ever mention the efforts of the Grove Restoration Project. 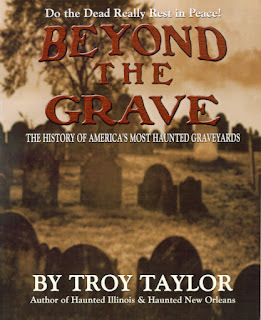 Also mentioned in a speech given by author Troy Taylor. Located near the southwest suburb of Midlothian is Rubio Woods Forest Preserve, an island of trees and shadows nestled in the urban sprawl of the Chicago area. The rambling refuge creates an illusion that it is secluded from the crowded city that threatens its borders, and perhaps it is. On the edge of the forest is a small graveyard that many believe may be the most haunted place in the region. The name of this cemetery is Bachelor's Grove and this ramshackle burial ground may be infested with more ghosts than most can imagine. Over the years, the place has been cursed with more than one hundred documented reports of paranormal phenomena, from actual apparitions to glowing balls of light. There have been no new burials here for many years and as a place of rest for the departed, it is largely forgotten. But if you should ask any ghost hunter just where to go to find a haunting, Bachelor's Grove is usually the first place in Chicago to be mentioned! The history of Bachelor's Grove has been somewhat shadowy over the years but most historians agree that it was started in the early part of the 1800's. The name of the cemetery came from a settlement that was started in the late 1820's that consisted of mostly German immigrants and settlers from the East Coast. One family who moved into the area was named "Batchelder" and their name was given to the timberland where they settled. It's likely the settlement and (later) the cemetery took its name from this family in the form of "Batchelor." Other accounts state that the cemetery's name comes from the fact that the settlement was called "Bachelor" because of a number of single men who came to live there. This part of the lore dates back to 1833 or 1834 when a man named Stephen H. Rexford settled in the region with some other single men and began calling the place "Bachelor's Grove." Some historians dispute this, stating that the name of "Batchelor's Grove" was already in use at that time. Regardless, the small settlement continued for some years as Bachelor's Grove, until 1850, when it was changed to "Bremen" by postmaster Samuel Everden in recognition of the new township name where the post office was located in 1855, it was changed again to "Bachelor's Grove" by postmaster Robert Patrick but the post office closed down just three years later. Officially, the settlement ceased to exist and was swallowed by the forest around it. The cemetery itself has a much stranger history. The land for the burial ground was first set aside in 1844 by Samuel Everden and was named "Everden" in his honor. The first burial took place in that year and as time passed, the eighty-two lots slowly began to fill. Burials continued here on a regular basis until around 1965, when things began to drop off. It should be noted that the last actual internment here was in 1989 when the ashes of a local resident were buried on the grounds. However, up until that point, the cemetery had been largely abandoned. The last independent caretaker of the cemetery was a man named Clarence Fulton, whose family were early settlers in the township. According to Fulton, Bachelor's Grove was like a park for many years and people often came here to fish and swim in the adjacent pond. Families often visited on weekends to care for the graves of the deceased and to picnic under the trees. Things have certainly changed since then! Problems began in and around the cemetery in the early 1960's, at the same time that the Midlothian Turnpike was closed to vehicle traffic in front of the cemetery. Even before that, the cemetery had become a popular "lover's lane" and when the road closed, it became even more isolated. Soon it began to show signs of vandalism and decay and a short time later, became considered haunted. Although the amount of paranormal activity that actually occurs in the cemetery has been argued by some, few can deny that strange things do happen here. When the various types of phenomenon really began is unclear but it has been happening for more than three decades now. Was the burial ground already haunted? Or did the haunting actually begin with the destructive decades of the1960's and 1970's? The vandals first discovered Bachelor's Grove in the 1960's and probably because of its secluded location, they began to wreak havoc on the place. Gravestones were knocked over and destroyed, sprayed with paint, broken apart and even stolen. Police reports later stated that markers from bachelor's Grove turned up in homes, yards and even as far away as Evergreen Cemetery! Worst of all, in 1964, 1975 and 1978, graves were opened and caskets removed. Bones were sometimes found to be strewn about the cemetery. Desecrated graves are still frequently found in the cemetery. Was the haunting first caused by these disturbances? Most believe so, but others cite another source for the activity. Near the small pond that borders the cemetery, forest rangers and cemetery visitors have repeatedly found the remains of chickens and other small animals that have been sliced and mutilated in a ritualistic fashion. Officers that have patrolled the woods at night have reported seeing evidence of black magic and occult rituals in and around the graveyard. In some cases, inscriptions and elaborate writings have been carved in and painted on trees and grave markers and on the cemetery grounds themselves. This has led many to believe that the cemetery has been used for occult activities. If you combine this sorted activity with the vandalism that has nearly destroyed the place, you have a situation that is ripe for supernatural occurrences. Could this be what has caused the blight on Bachelor's Grove? Even the early superstitions of the tombstone give credence to the idea that man has always felt that desecration of graves causes cemeteries to become haunted. Grave markers began as heavy stones that were placed on top of the graves of the deceased in the belief that the weight of it would keep the dead person, or their angry spirit, beneath the ground. Those who devised this system believed that if the stone was moved, the dead would be free to walk the earth. There is no question that vandals have not been kind to Bachelor's Grove, but then neither has time. The Midlothian Turnpike bypassed the cemetery and even the road leading back to the graveyard was eventually closed. People forgot about the place and allowed it to fade into memory, just like the poor souls buried here. Today, the cemetery is overgrown with weeds and is surrounded by a high, chain-link fence, although access is easily gained through the holes that trespassers have cut into it. The cemetery sign is long since gone. It once hung above the main gates, which are now broken open and lean dangerously into the confines of Bachelor's Grove. The first thing noticed by those who visit here is the destruction. Tombstones seem to be randomly scattered about, no longer marking the resting places of those whose names are inscribed upon them. Many of the stones are missing, lost forever and perhaps carries away by thieves. These macabre crimes gave birth to legends about how the stones of the cemetery move about under their own power. The most disturbing things to visitors though are the trenches and pits that have been dug above some of the graves, as vandals have attempted to make off with souvenirs from those whose rest they disturb. Near the front gate is a broken monument to a woman whose name was heard being called repeatedly on an audio tape. Some amateur ghost hunters left a recording device running while on an excursion to Bachelor's Grove and later, upon playback of the tape, they discovered that the recorder had been left on the ruined tombstone of a woman that had the same name as that being called to on the tape. Coincidence? Perhaps, but it hardly seems likely. Just beyond the rear barrier of the cemetery is a small, stagnant pond that can be seen by motorists who pass on 143rd Street. This pond, while outside of the graveyard, is still not untouched by the horror connected to the place. One night in the late 1970's, two Cook County forest rangers were on night patrol near here and claimed to see the apparition of a horse emerge from the waters of the pond. The animal appeared to be pulling a plow behind it that was steered by the ghost of an old man. The vision crossed the road in front of the ranger's vehicle, was framed for a moment in the glare of their headlights, and then vanished into the forest. The men simply stared in shock for a moment and then looked at one another to be sure that had both seen the same thing. They later reported the incident and since that time, have not been the last to see old man and the horse. Little did the rangers know, but this apparition was actually a part of an old legend connected to the pond. It seems that in the 1870's, a farmer was plowing a nearby field when something startled his horse. The farmer was caught by surprise and became tangled in the reins. He was dragged behind the horse and it plunged into the small pond. Unable to free himself, he was pulled down into the murky water by the weight of the horse and the plow and he drowned. Since that time, the vivid recording of this terrible incident has been supernaturally revisiting the surrounding area. In addition to this unfortunate phantom, the pond was also rumored to be a dumping spot for murder victims during the Prohibition era in Chicago. Those who went on a "one-way ride" were alleged to have ended the trip at the pond near bachelor's grove. Thanks to this, their spirits are also said to haunt the dark waters. Strangely though, it's not the restless spirits of gangland execution victims that have created the most bizarre tales of the pond. One night, an elderly couple was driving past the cemetery and claimed to see something by the bridge at the edge of the pond. They stopped to get a closer look and were understandably terrified to see a huge, two-headed man come out from under the bridge and cross in the light from their headlights! Whatever this creature may have been, it quickly vanished into the woods. Incredibly, even the road near Bachelor's grove is reputed to be haunted. Could there be such a taint to this place that even the surrounding area is affected? The Midlothian Turnpike is said to be the scene of vanishing "ghost cars" and phantom automobile accidents. No historical events can provide a clue as to why this might be, but the unexplained vehicles have been reported numerous times in recent years. The stories are all remarkably the same too. People who are traveling west on the turnpike see the tail lights of a car in front of them. The brake lights go on, as if the car is planning to stop or turn. The car then turns off the road. However, once the following auto gets to the point in the road where the first vehicle turned, they find no car there at all! Other drivers have reported passing these phantom autos, only to see the car vanish in their rearview mirrors. One young couple even claimed to have a collision with one of these phantom cars in 1978. They had just stopped at the intersection of Central Avenue and the Midlothian Turnpike. The driver looked both ways, saw that the road was clear in both directions, then pulled out. Suddenly, a brown sedan appeared from nowhere, racing in the direction of the cemetery. The driver of the couple's car hit the brakes and tried to stop, but it was too late to avoid the crash. The two vehicles collided with not only a shuddering impact, but with the sound of screeching metal and broken glass as well. To make the event even more traumatic, the couple was then shocked to see the brown sedan literally fade away! They climbed out of their car, which had been spun completely around by the impact, but realized that it had not been damaged at all. They had distinctly heard the sound of the torn metal and broken glass and had felt the crush of the two cars coming together, but somehow it had never physically happened! For those searching for Bachelor's Grove, it can be found by leaving the roadway and waking up an overgrown gravel track that is surrounded on both sides by the forest. The old road is blocked with chains and concrete dividers and a dented "No Trespassing" sign that hangs ominously near the mouth to the trail. The burial ground lies about a half-mile or so beyond it in the woods. It is along this deserted road where other strange tales of the cemetery take place. One of these odd occurrences is the sighting of the "phantom farm house." It has been seen appearing and disappearing along the trail for several decades now. The reports date back as far as the early 1960's and continue today. The most credible thing about many of the accounts is that they come from people who originally had no idea that the house shouldn't be there at all. The house has been reported in all weather conditions and in the daylight hours, as well as at night. There is no historical record of a house existing here but the descriptions of it rarely vary. Each person claims it to be an old frame farm house with two-stories, white, wooden posts, a porch swing and a welcoming light that burns softly in the window. Popular legend states that should you enter this house though, you would never come back out again. As witnesses approach the building, it is reported to get smaller and smaller until it finally just fades away, like someone switching off on old television set. No one has ever claimed to set foot on the front porch of the house. But the story gets stranger yet! In addition to the house appearing and disappearing, it also shows up at a variety of locations along the trail. On one occasion it may be sighted in one area and then at an entirely different spot the next time. Author Dale Kaczmarek, who also heads the Ghost Research Society paranormal investigation group, has interviewed dozens of witnesses about the paranormal events at Bachelor's Grove. He has talked to many who say they have experienced the vanishing farm house. He has found that while all of their descriptions of the house are identical, the locations of the sightings are not. In fact, he asked the witnesses to place an "X" on the map of the area where they saw the house. Kaczmarek now has a map of the Bachelor's Grove area with "X's" all over it! Also from this stretch of the trail come reports of "ghosts lights." One such light that has been reported many times is a red, beacon-like orb that has been seen flying rapidly up and down the trail to the cemetery. The light is so bright, and moves so fast, that it is impossible to tell what it really looks like. Most witnesses state that they have seen a "red streak" that is left in its wake. Others, like Jack Hermanski from Joliet, have reported seeing balls of light in the woods and in the cemetery itself. These weird lights have sometimes been reported moving in and around the tombstones in the graveyard. Hermanski encountered the lights in the early 1970's and chased a number of them. All of the lights managed to stay just out of his reach. However, a woman named Denise Travers did manage to catch up with one of the blue lights in December 1971. She claimed to pass her hand completely through one of them but felt no heat or sensation. Besides the aforementioned phenomena, there have been many sightings of ghosts and apparitions within Bachelor's Grove Cemetery itself. The two most frequently reported figures have been the "phantom monks" and the so-called "Madonna of Bachelor's Grove." The claims of the monk-like ghosts are strange in themselves. These spirits are said to be clothed in the flowing robes and cowls of a monastic order and they have been reported in Bachelor's Grove and in other places in the Chicago area too. There are no records to indicate that a monastery ever existed near any of the locations where the "monks" have been sighted though, making them one of the greatest of the area's enigmas. The most frequently reported spirit though is known by a variety of names from the "Madonna of Bachelor's Grove" to the "White lady" to the affectionate name of "Mrs. Rogers." Legend has it that she is the ghost of a woman who was buried in the cemetery next to the grave of her young child. She is reported to wander the cemetery on nights of the full moon with an infant wrapped in her arms. She appears to walk aimlessly, with no apparent direction and completely unaware of the people who claim to encounter her. There is no real evidence to say who this woman might be but, over the years, she has taken her place as one of the many spirits of this haunted burial ground. And there are other ghosts as well. Legends tell more apocryphal tales of a ghostly child who has been seen running across the bridge from one side of the pond to the other, a glowing yellow man and even a black carriage that travels along the old road through the woods. Many of these tales come from a combination of stories, both new and old, but the majority of first-hand reports and encounters are the result of literally hundreds of paranormal investigations that have been conducted here over the last forty years. Many of the ghost hunters who come to this place are amateur investigators, looking for thrills as much as they are looking for evidence of the supernatural, while others, like Dale Kaczmarek and the Ghost Research Society, are much more on the serious side. Kaczmarek and his investigators have turned up many clues and pieces of evidence that seem to fit randomly into the mystery of Bachelor's Grove. These mysterious bits of evidence, while showing that strange things do happen here, never really seem to provide the hard evidence that these researchers look for. Even the photographs collected during their outings tantalize the investigators. For example, a series of photos taken by the group in 1979 show a monk-like figure standing near the cemetery fence. The figure appeared to be wearing a hooded robe and holding a baby in its arms. Oddly, this was three years before the Ghost Research Society collected any accounts of the "White Lady!" Perhaps the most stunning photograph from Bachelor's Grove was taken in August 1991, during a full-fledged investigation of the cemetery. Ghost Research Society members came to the burial ground in the daytime and covered the area with the latest scientific equipment, cameras, tape recorders and video cameras. All of the members were given maps of the cemetery and instructed to walk through and note any changes in electromagnetic readings or atmosphere fluctuations. After the maps were compared, it was obvious that several investigators found odd changes in a number of distinct areas. A number of photos were taken in those areas, using both standard and infrared film. Nothing was seen at the time the photographs were taken, but once they were developed, the investigators learned that something had apparently been there! In a photo, taken by Mari Huff, there appeared the semi-transparent form of a woman, who was seated on the remains of a tombstone. Was this one of the ghosts of Bachelor's Grove? Skeptics immediately said "no", claiming that it was nothing more than a double exposure or an outright hoax. Curious, I asked for and received a copy of the photograph and had it examined by several independent photographers. Most of them would have liked to come up with a reason why the photograph could not be real, but unfortunately they couldn't. They ruled out the idea of a double exposure and also the theory that the person in the photo was a live woman who was placed in the photo and made to appear like she was a ghost. One skeptic also claimed that the woman in the photo was casting a shadow, but according to the photographers who analyzed the image, the "shadow" is actually nothing more than the natural shading of the landscape. Besides that, one of them asked, if she is casting a shadow in that direction, then why isn't anything else in the frame? Genuine or not (and I think it is), this photograph is just one of the hundreds of photos taken here that allegedly show supernatural activity. While many of them can be ruled out as nothing more than atmospheric conditions, reflections and poor photography, there are others that cannot. In the end, we have to ask, what is it about Bachelor's grove Cemetery? Is it as haunted as we have been led to believe? I have to leave that up to the reader to decide, but strange things happen here and there is little reason to doubt that this is one of the most haunted places in the Midwest. But haunted or not, Bachelor's Grove is still a burial and a place that should be treated with respect as the final resting place of those interred here. It should also be remembered that the cemetery is not a private playground for those who are intrigued by ghosts and hauntings. It is first and foremost a repository for the dead and should be protected as such by those who hope to enjoy it, and possibly learn from it, in the years to come. Thanks to the efforts of local preservation groups, it appears that Bachelor's Grove is not beyond restoration, but it should still be protected against the abuses that it has suffered in the past. It is a piece of our haunted history that we cannot afford to lose.